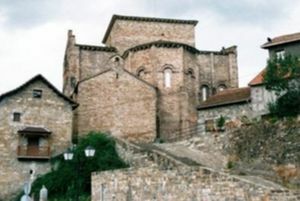 Hecho (Echo in Aragonese) is a small village in Aragón. Castilian (Spanish) is the official language and is spoken by everyone, but the native language is Aragonese in its local form, called cheso, still used vigorously. The village itself - not as old as it appears but full of old alleys and steps. Siresa - a small village higher up the valley where the bus goes if demanded but easily walkable. There is a 9th century monastery here -ask for the key from the house above the bar.In the bar they sell beer in half-frozen glasses(which is great after a long hot walk in the mountains). It's a great base for walking holidays. Spend all day up in the mountains and come back for eating and sleeping. There's a little museum in Hecho, showing rural life with photographs and old farming equipment.It has limited opening hours though. Casa Blasquica - near the bus stop. Excellent food. This page was last edited on 28 April 2010, at 10:01.